A mundane domestic object like a ‘bottle lamp’ used to light up the dark world of the poor is little recognised in the local context. But the story of this bottle lamp is going global now. 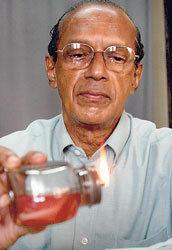 The Safe Bottle Lamp Foundation founded by Lankan Consultant Surgeon Dr. Wijaya Godakumbura was launched as a burns prevention campaign in 1992. Since then it has reached thousands of households, reducing the number of burn injuries/deaths that occur among the poorest of poor; especially those in rural areas due to the use of makeshift unsafe kerosene oil lamps. Both children and adults alike become victims of these devastating accidents. 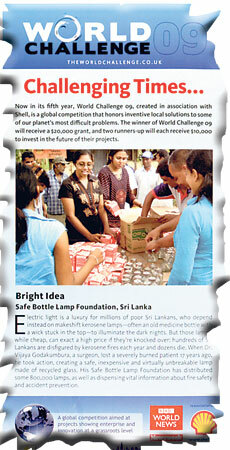 Now in recognition of the quantum of work carried out over the years, the Safe Bottle Lamp Project has been picked as one of 12 finalists in the global contest - ‘The World Challenge – 09’ conducted by BBC, Newsweek and Shell. In the running for this prestigious prize this year are projects from countries like the USA, India, Indonesia, Thailand etc. In 2006, it was a winner from Sri Lanka as Maximus, the elephant paper project took the prize. Elaborating on how the Safe Bottle Lamp project came about, Dr. Godakumbura says that as a doctor he had been a witness to many victims who had come to hospitals with horrible injuries caused by unsafe kerosene bottle lamps. “Such injuries cause pain lasting for weeks and months; deformity and disfiguration or death. When I was in Ratnapura hospital- I remember how patients kept coming to the ward, most of them children and women. Once there was this incident where a 19- year-old who was admitted to hospital with severe burn injuries died the next day. That prompted me to do something to prevent injuries caused by unsafe kerosene lamps,” Dr. Godakumbura says. To replace this, he invented the safe alternative ‘Sudeepa’ which doesn’t tip over that easily since it is short and heavy. The lamp is made of thick glass and consists of two flat sides to prevent it from rolling even if it topples. The metal lid can be screwed on tightly preventing oil leakage. The October 12 issue of the Newsweek features the Sri Lankan and Namibian entries as part of a series on the finalists. Above is a montage of the bottle lamp entry. Up to now, over 750,000 such safe lamps have been manufactured and distributed free of charge in all parts of the island except in the north, the doctor says adding that they encounter difficulties like transportation issues and lack of sales outlets when trying to reach rural areas. “We try to collect donations and distribute the lamps in different areas with the support of the Divisional Secretariats, youth and women’s clubs. When we distribute these safe bottle lamps, we collect the old unsafe ones from the community and destroy them,” he says. Initially when the project was implemented there were on average, about 400 burn injuries per year of which one third were caused by kerosene bottle lamps. This number is now gradually decreasing yet the sale and use of unsafe bottle lamps particularly in the slum areas in Colombo still continues, Dr. Godakumbara says. Seventeen years down the line, their enthusiasm to develop the project is ‘sky high’. Winning the global contest which carries with it USD 20,000 prize would enable them reach greater heights and bring their work to a wider audience. The words of Sir Arthur C. Clarke who acclaimed the genuine efforts of an individual who invented a ‘safe’ bottle lamp to replace the makeshift kerosene bottle lamp best described why this tiny object has received international recognition.